The War Department, in conjunction with the president of North American Aviation, J. H. Kindelberger, selected the Fairfax District as a result of its geographic location and the heavy lobbying on the part of Kansas City business leaders. The war industry had become concentrated on the east and west coasts, where military strategists feared potential attacks from the Germans or Japanese if the U.S. entered the war. Due to its location near the center of the country and a significant population of potential laborers, Kansas City fit the basic requirements for a war plant. The Kansas City Chamber of Commerce unsurprisingly agreed that it was the "logical location" for war plants. The other draw to Kansas City came from local business leaders who stressed Kansas Citians’ productive potential and loyalty. J. C. Nichols, who served on the Advisory Council for National Defense, argued that Kansas City was a "sleeping industrial giant." Other business leaders stressed the city’s identity as the "Most American City" due to its unusually high percentage of white, American-born citizens, who were more likely to remain loyal. This presumably made the location resistant to sabotage by foreigners or unpatriotic citizens. Over the next two years, in addition to North American Aviation, Inc., the area welcomed the Remington Arms Company near Independence, a Pratt and Whitney aircraft engine plant at Bannister and Troost, and the Darby Corporation shipyards at the confluence of the Missouri and Kaw Rivers. Precisely a year after the Fairfax plans were announced, the United States entered the war following the Japanese attack on Pearl Harbor. Although an estimated 40,000 local residents joined the army and left the area, the war industries fueled population growth. Kansas City, Missouri’s population surpassed 400,000. 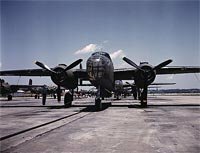 The Fairfax plant alone attained employment levels of 26,000 workers and produced 6,608 of the 9,816 total B-25 Mitchell bombers manufactured during the war. With so many men enlisting in the military, the Kansas City war plants, like all American war plants, hired more women as production quotas increased and male laborers left for the military. At Fairfax, for example, forty percent of the workers were women in 1944. In addition, female pilots in the Women’s Air Force Service Pilots, a civilian service to transport military aircraft under direction of the Air Transport Command, flew many of the completed planes to their destinations. At the time, female employment on such a scale was unprecedented and resented by many, but it was necessary to maintain production. Following the war, the Fairfax plant closed, and the airport was annexed by Kansas City, Kansas. Transcontinental and Western Air (which in 1950 was renamed Trans World Airlines or simply TWA) acquired the nearby B-25 Modification Center to use as an overhaul base until it was destroyed in the 1951 flood. In 1945, General Motors (GM) leased the B-25 plant and produced cars in the building until May 8, 1987. It then razed the historic bomber plant on January 19, 1989, to make room for the $1 billion Fairfax Assembly Plant. View images of the Fairfax B-25 bomber plant that are a part of the Missouri Valley Special Collections. Check out the following articles about the Fairfax B-25 bomber plant. "'We All Had a Cause': Kansas City's Bomber Plant, 1941-1945," in Kansas History, by Richard Macias; discusses the Fairfax plant and the demographics of workers, including the resistance toward hiring African American workers, includes images. "The Fairfax Airport and Its Role in World War II," in the The Historical Journal of Wyandotte County, by Edwin D. Shutt. View the documentary Over Here: The Story of Kansas City & World War II by Pamela Reichart. Continue researching war industries and the Fairfax airport using archival material from the Missouri Valley Special Collections. Rick Montgomery & Shirl Kasper, Kansas City: An American Story (Kansas City, MO: Kansas City Star Books, 1999), 236-237, 239-246. Henry C. Haskell, Jr. and Richard B. Fowler, City of the Future: A Narrative History of Kansas City, 1850-1950 (Kansas City, MO: Frank Glenn Publishing, 1950), 167. George R. Bauer, A Century of Kansas City Aviation History: The Dreamers and the Doers (Kansas City, MO: Historic Preservation Press, 1999), 68, 86-91, 105-112, 168. Richard Macias, "'We All Had a Cause': Kansas City's Bomber Plant, 1941-1945," Kansas History 28, no. 4 (Winter 2005-2006), 244-261.